AP Services, a product and service brand of Curtiss-Wright, has state-of-the-art gasket manufacturing technology using CNC driven water jet cutters. SBR (Styrene Butadiene Rubber) Sheet Emulsion SBR contains 23.5% styrene and 76.5 % butadiene. Style 442 SBR is the most widely used synthetic rubber. It has good aging, abrasion, and tear resistant properties. Style 442 is a smooth plate finish sheet. 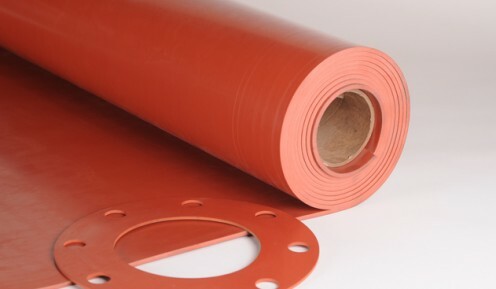 Red Rubber is good for use in low pressure steam applications, hot and cold water, and air. Avoid using this sheet in oil applications, as it has no oil resistance. Style 442 is available in sheets, bulk rolls, and pre-cut gaskets. AP Style 442A- Premium Grade black SBR sheet with higher tensile strength. AP Services, a product and service brand of Curtiss-Wright, has state-of-the-art gasket manufacturing technology using CNC driven water jet cutters. Style 461 is an SBR compound rubber reinforced with a close weave polyester fabric. This construction included one ply of fabric for each 1/16” thickness. Cloth reinforcement enhances dimensional stability in flanged gasket applications with high compression loads. Style 461 is a smooth plate finish sheet manufactured from a SBR based Compound. Cloth Inserted SBR rubbers are good for use in air, hot water, saturated steam, low pressure steam, and hydraulic applications. Avoid using this sheet in oil applications, as it has no oil resistance. Style 461 is available in sheets, bulk rolls, and pre-cut gaskets. AP Services, a product and service brand of Curtiss-Wright, has state-of-the-art gasket manufacturing technology using CNC driven water jet cutters. Style 449 Pure Gum Rubber is a full floating natural rubber. Style 449 is manufactured from pure Gum Rubber to form a smooth resilient sheet. Gum Rubber has superior resilience, tensile, elongation, and abrasion resistance properties. It has excellent tear strength, is resistant to water, most salts, mild acids, and many other chemicals, and is non-marking and non-toxic. Examples of conditions where the use of Gum Rubber should be avoided are: environments involving ozone, strong acids, animal fats, oils, greases, and most hydrocarbons. Style 449 is available in sheets, bulk rolls, and pre-cut gaskets. AP Services, a product and service brand of Curtiss-Wright, has state-of-the-art gasket manufacturing technology using CNC driven water jet cutters. Style 458 is a neoprene compound with low temperature flexibility and oil resistance. This rubber is chemically inert and resists rotting, checking and cracking due to weather exposure. Style 458 is a smooth plate finish sheet utilizing a high quality neoprene blend. 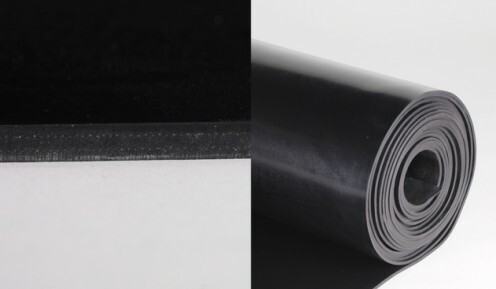 Neoprene rubbers are good for use in oils, water, weather, oxidation and sunlight. Neoprene can be manufactured in numerous different durometer ratings. Please call with your specific requirements. Style 458 is available in sheets, bulk rolls, and pre-cut gaskets. AP Services, a product and service brand of Curtiss-Wright, has state-of-the-art gasket manufacturing technology using CNC driven water jet cutters. Style 458CI is a medium grade neoprene compound with one or more polyester fabric plies, for service where dimensional stability is required. Fabric content is one ply for 1/32” and 1/16”, two plies for 1/8”, three plies for 3/16”, and four plies for ¼” thick. Style 458CI is a smooth plate finish sheet manufactured from a Neoprene based Compound. 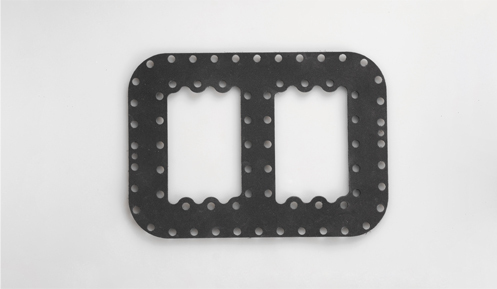 Cloth Inserted Neoprene rubbers are good for use in oil, hot or cold water, and gas applications. Style 458CI is available in sheets, bulk rolls, and pre-cut gaskets. AP Services, a product and service brand of Curtiss-Wright, has state-of-the-art gasket manufacturing technology using CNC driven water jet cutters. Style 465CI is an oil resistant neoprene blended sheet reinforced with polyester fabric. It is capable of permitting relative motion between a stationary and a moving member while maintaining a separation of the two media on either side and may maintain a pressure differential between the two media. Style 465CI is a smooth plate finish sheet manufactured from superior components and properties for long service life. Neoprene Diaphragm rubbers are good for use in oils, gases, and air in gauges, meters, and valves. This material also makes for an excellent weather stripping material. *It should be careful assessed for suitability to assure low permeability to the fluids or gases it will separate. Style 465CI is available in sheets, bulk rolls, and pre-cut gaskets. AP Services, a product and service brand of Curtiss-Wright, has state-of-the-art gasket manufacturing technology using CNC driven water jet cutters. EPDM or Ethylene-propylenediene rubber terpolymer provides superior properties for outdoor and high temperature applications. It has good chemical and electrical properties and resists animal and vegetable oils, ozone, sunlight, and oxygenated solvents. Style 482 is manufactured to a smooth plate finish. The material provides excellent resistance to heat, cold, oxidation, steam, water, and ultraviolet light. EPDM also has excellent resistance to phosphate ester hydraulic fluids and polar solvents like MEK and acetone. 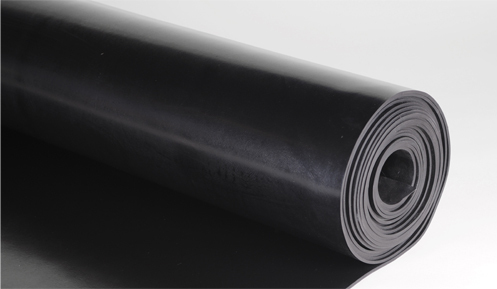 EPDM rubber should be avoided being used with mineral products (oils, greases, and fuels). Style 482 is available in sheets, bulk rolls, and pre-cut gaskets. EPDM can be manufactured in numerous different compounds and durometer ratings. Please call with your specific requirements. AP Services, a product and service brand of Curtiss-Wright, has state-of-the-art gasket manufacturing technology using CNC driven water jet cutters. Silicone rubber is a material containing carbon, hydrogen, and oxygen. Silicone rubber is generally non-reactive, stable, and resistant to extreme environments and temperatures. Silicone Rubber is used in applications where physical properties are not critical but extreme temperature resistance is necessary. This rubber possesses the most resistance to high temperature of all rubber sheets, has great UV and ozone resistance, and excellent resistance to Fungus, Acetic Acid, Ammonia Gas (hot and cold), oils, Lime Sulfur, Methyl Ether, and Sodium Sulfate. Style 475 is available in sheets, bulk rolls, and pre-cut gaskets. Silicone can be manufactured in numerous different durometer ratings. Please call with your specific requirements. AP Services, a product and service brand of Curtiss-Wright, has state-of-the-art gasket manufacturing technology using CNC driven water jet cutters. Style 476 is a clean, convenient, and practical one-piece gasket material that is an excellent joint filler for all types of sealing applications. Style 476 is a rubber product produced by a manufacturing process that utilizes gas forming ingredients in the rubber compound or by subjecting the compound to a high pressure gas such as nitrogen. Closed cell rubber is defined as a product whose cells are totally enclosed by its walls and hence not interconnecting with other cells. 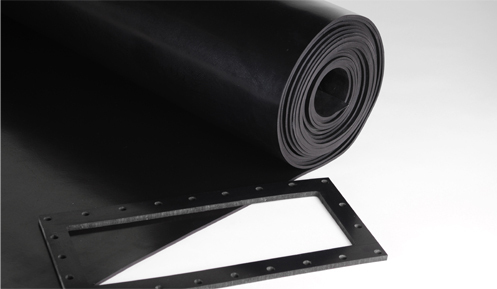 Closed Cell Neoprene is an excellent sealing material for moisture, dust, air, gas, smoke, and noise. Style 476 is available in sheets, pre-cut gaskets, and with pressure sensitive adhesive on one side to aid installation. AP Style 477 – Sponge Silicone- Higher Temperature Rating- 450° F Max. Closed Cell products can be manufactured in numerous different densities and grades. Please call with your specific requirements. Thickness 1/16”, 1/8”, 3/16”, 1/4”, 1/2", 3/4"
AP Services, a product and service brand of Curtiss-Wright, has state-of-the-art gasket manufacturing technology using CNC driven water jet cutters. Nitrile rubber (NBR) or Buna N is the general term for acrylonitrile butadiene copolymer. The acrylonitrile content of nitrile sealing compounds varies considerably (18% to 50%) and influences the physical properties of the finished material. The higher the acrylonitrile content, the better the resistance to oil and fuel. At the same time, elasticity and resistance to compression set is adversely affected. In view of these opposing realities, a compromise is often drawn, and a medium acrylonitrile content selected. Style 480 is a smooth plate finish sheet manufactured from a Nitrile based Compound. Buna N rubbers have good oil and gasoline resistance, tensile strength, elongation properties, heat resistance, and low compression set. This rubber works well on many acids, petroleum, mineral and vegetable oils. Examples of conditions where the use of Buna N should be avoided are: Fuels of high aromatic content, aromatic and chlorinated hydrocarbons, ketone, acetone, acetic acid, ethylene-ester, strong acids, brake fluids, and ozone, weather and atmospheric aging environments. 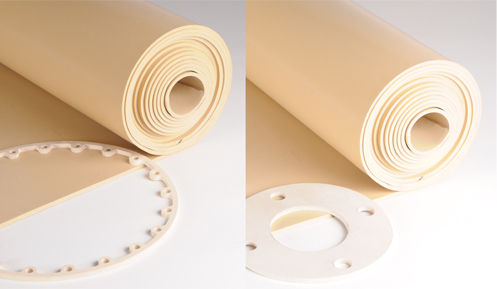 Style 480 is available in sheets, bulk rolls, and pre-cut gaskets. Buna N can be manufactured in numerous different durometer ratings. Please call with your specific requirements. AP Services, a product and service brand of Curtiss-Wright, has state-of-the-art gasket manufacturing technology using CNC driven water jet cutters. Viton® Fluorocarbon rubber (FKM) or Fluoroelastomer was originally developed in 1957 by DuPont® as an answer to high temperature applications that also can resist chemical attack. AP Services style 485 is manufactured using 100% virgin Viton® Fluorocarbon FKM. The material provides good sealing qualities in applications requiring resistance to temperature, weathering, and gas permeability. This unique product stands up to ozone, fuels, aliphatic hydrocarbons, aromatic hydrocarbons, lubricants, organic solvents, certain acids, and many corrosive industrial applications. Examples of conditions where the use of Fluorocarbon rubber should be avoided are: ketones, low molecular weight organic acids, superheated steam, and glycol based fluids. Style 485 is available in sheets, bulk rolls, and pre-cut gaskets. Fluorocarbon can be manufactured in numerous different compounds and durometer ratings. Please call with your specific requirements. AP Services, a product and service brand of Curtiss-Wright, has state-of-the-art gasket manufacturing technology using CNC driven water jet cutters. Hypalon is a trademark for chlorosulfonated synthetic rubber (CSM) originally developed by DuPont® as an answer for its resistance to chemicals, temperature extremes, and ultraviolet light. Style 470 is manufactured using 100% Hypalon in a smooth sheet. Hypalon is one of the most weather-resistant elastomers available as the rubber material demonstrates almost complete resistance to UV/ozone and will not degrade in long-term sunlight exposure. 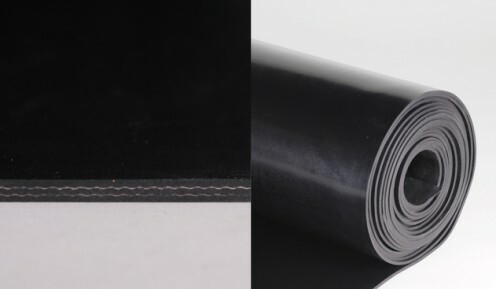 This rubber also has excellent resistance to abrasion, outstanding resistance to most chemicals, oils and acids, good dielectric strength, and low moisture absorption. Style 470 is available in sheets, bulk rolls, and pre-cut gaskets. Hypalon can be manufactured in different durometer ratings. Please call with your specific requirements.